WALPOLE, Maine — Something was wrong with the larvae. Bill Mook noticed the newly born oysters of his coastal hatchery often failed to thrive after heavy rainfalls. The storms left the brackish seawater he was pumping into his tanks from the nearby Damariscotta River estuary too acidic for the pinhead-sized mollusks. To stay in business, he had to change the pH balance of the water. And as heavy storms have become more frequent in recent years, he has had to adjust that balance more often to keep the oysters alive. 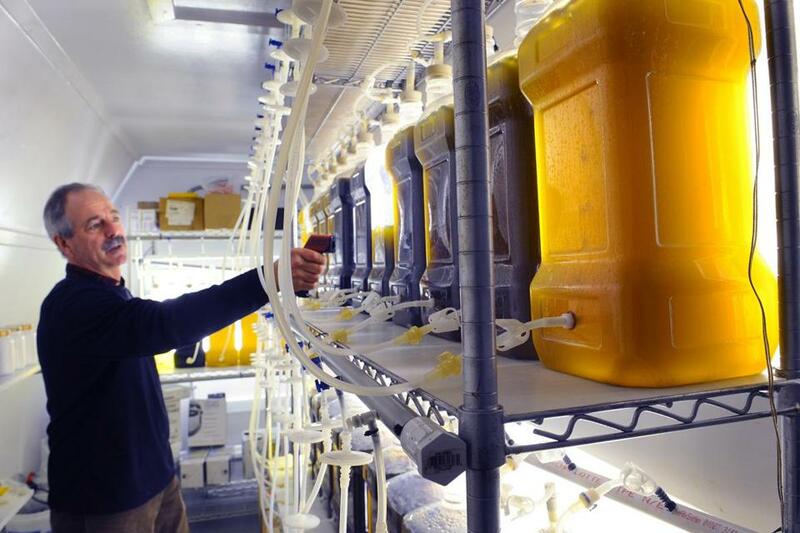 His experience reflects drastic changes in the chemistry of coastal waters, the result of increasing acidification, which have been setting off alarms among fishermen, climate scientists, and policy makers from Cape Cod to Casco Bay. The problems stem from a surge of carbon dioxide in the atmosphere from fossil fuels that has made oceans on average 30 percent more acidic at the surface since the Industrial Revolution, according to the National Oceanic and Atmospheric Administration. NOAA scientists predict they will become 150 percent more acidic by 2100 — more than at any point in the past 20 million years. Acidification has also been exacerbated by the region’s increasing precipitation. Federal reports have shown that rain or snow from heavy storms have increased more than 70 percent over the past 50 years in New England. The fresh water that drains from land is significantly more acidic than seawater and frequently carries sewage, organic matter, and other nutrients that add carbon dioxide in coastal waters. The Gulf of Maine, which extends from Cape Cod to Nova Scotia, is especially vulnerable to acidification, because carbon dioxide is absorbed more easily in colder water, and much of the region’s economy relies on the sea life that is most likely to suffer. Studies have shown the additional acid makes it harder for clams, oysters, lobster, mussels, shrimp, scallops, and similar organisms to develop their shells, ultimately making them more vulnerable to prey and less likely to reproduce. The concerns about ocean acidification led the Maine Legislature to release a landmark report in February that detailed the potential dangers to the state’s lobster-reliant economy and ways the state should respond. Lawmakers on Beacon Hill this year introduced a bill to establish a similar commission to study the impact of more acidic waters off Massachusetts. The oceans are becoming acidic at a rate 100 times faster than at any time in the past 55 million years, he said. Changes that previously took more than 10,000 years, he said, are now occurring over a period of several decades. 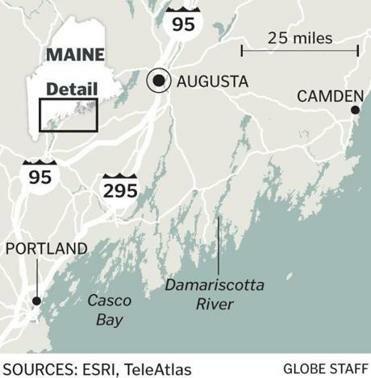 Because more than 60 rivers flow into the Gulf of Maine and cold water circulates from the north, the threat to the region’s fisheries is “ground zero for ocean acidification,” he said. He cited a range of recent experiments that have shown how more-acidic water leads to higher mortality, depressed growth, pitted shells, and lower survivability of larvae. The mortality rates of bay scallop larvae, for example, are 30 percent higher in today’s waters than in those of the 1950s, he said. Similar studies have shown that only 45 percent of hard clam larvae survive longer than five weeks in today’s oceans, down from 60 percent in the 1950s, he said. If the oceans become acidic at expected rates, only 25 percent of clam larvae are expected to survive by 2100. Bill Mook took a temperature reading at Mook Sea Farm in Walpole, Maine. In Casco Bay, mud flats that clammers had abandoned because of poor productivity were found to be more acidic than others that remain active, said Cathy Ramsdell, executive director of the Friends of Casco Bay in South Portland. The group, which has tracked a steady increase in the acidity of their coastal waters, also performed tests of young clams in different mud flats in the area, finding greater erosion of shells in those that were more acidic. At Bigelow Laboratory for Ocean Sciences in East Boothbay, Maine, researchers are studying the impact of more acidic water on lobster larvae and copepods, teardrop-shaped crustaceans that serve as a vital part of the oceanic food web. Last year, the lobster harvest generated more than $450 million in Maine and accounted for about 85 percent of all lobsters caught in the United States. Their findings so far show a decline in respiration rates of the larvae and copepods in waters that simulate the chemistry of the oceans that scientists predict for the next century. Lower breathing rates could reduce their swimming speed, making it harder to catch prey and escape predators, said Jesica Waller, a University of Maine graduate student performing the research. “That shows us some part of their physiology may be compromised, and that they may be experiencing internal stress,” she said. A study in the journal Nature Climate Change last month found that coastal communities in 15 states, including Maine and Massachusetts, are likely to suffer economic consequences from ocean acidification. Over the past decade, the Pacific Northwest has seen a near-collapse of its shellfish industry — with tens of millions of dollars in losses — because of the increased acidification of its waters. The report’s authors have urged vulnerable states to do more to assess their risks and to take action. They suggest that states reduce acid-promoting pollutants that filter into the ocean from land, diversify their fishing fleets, invest in aquaculture of high-value shellfish species, build detection systems for when waters become too corrosive, and cultivate oysters that are more resistant to acidification. The message is beginning to resonate in Massachusetts, where Hauke Kite-Powell, a research specialist in the marine policy center at the Woods Hole Oceanographic Institution, briefed lawmakers on Beacon Hill last month about the state’s vulnerability to acidification. “I explained how the science is convincing that the problems are going to get worse for several decades,” he said. Among the lawmakers was Representative Tim Madden, a Nantucket Democrat. He introduced a bill in January that would bring together lawmakers, fishermen, environmental advocates, and state officials on a commission that would recommend how the state should address acidification. The shellfish industry generates about $300 million in annual revenue for southern Massachusetts. “I worry that this could have a major effect on our state,” he said. At Bill Mook’s hatchery in Walpole, the risks are no longer hypothetical. Over the past decade, as more heavy storms have increased run-off into the Damariscotta estuary, the state has increasingly often enforced temporary bans on shellfish harvesting. Last year, citing safety concerns, the state required Mook and other oyster farmers in the area to shut down 13 times — more than twice as many as between 2000 and 2004. The changing chemistry of the estuary has meant his staff has had to change how and when they pump water into their tanks, how they aerate them, and what they do to maintain an optimal pH for their oysters. Since they made those changes, Mook said, their larvae have thrived and the outlook for his business has improved.